As analyzing the racelogs from latest with the ZX14 (with hayabusa ecu) we detected that the GPS sensor reading was somewhat unstable causing problems during the run. The rider rides with preload on the gear lever and that method seems to put the GPS in between connection points. I am not running with preload so have not noticed this with busa. How about the others - are you running with preload if yes, are you seeing GPS unstablizing before shifting. Anyway to fix this I am thinking to add functionality to the ecu that GPS sensor will be detected only after stabilization period - and that a gear can only run in sequence up and down. petrik you could try extending the pads on the gps sensor on the kawi, it looks similar to the older busas if i remember correctly. im guessing as he loads the shift the drum contacts are no longer touching brass pads. Or maybe you could change the shape of the contacts, on the busa they are pretty round if i remember correctly, maybe if they were a little flatter would remain contacting brass pad when preloaded. 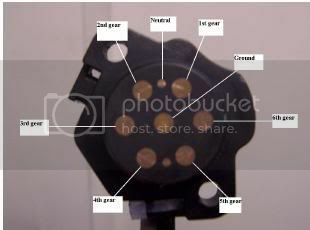 or possible even open the holes up on the sensor a little bit (mounting holes) to allow sensor to be clocked in one direction or the other slightly. how about adding a delay to the algrothim, if the gps "sees" a premature ohm change, you could put a delay before the programmed kill, with a selectable button for those who foot shift..? I will add a filter algorithm to the MIL LED light module as in stock bikes this is unlikely to be needed. We tried with offset and that seems to make the cure. Many thanks to you for suggesting it! Hi, I easured similar problems on my bandit. Every time after shifting the ecu detects a wrong gear and is stabilized a few ms after. But this failure produces igniton adjustment problems due to different Maps depending on gear. This results in torque 'jumps'. Could you please tell me under azocka@freenet.de what you did with the offset of the GPS? Just an other adjustment or putting a resistance in the circuit?